Nearly everyone's spinal discs show signs of wear as they age. Not everyone, however, will have degenerative disc disease. Not actually a disease, this is a condition in which a damaged disc causes pain. A wide range of symptoms and severity is associated with this condition. A firm, tough outer layer, the anulus fibrosus. The outer portion of this layer contains nerves. If the disc tears in this area, it can become quite painful. A soft, jellylike core, the nucleus pulposus. This part of the disc contains proteins that can cause the tissues they touch to become swollen and tender. If these proteins leak out to the nerves of the outer layer of the disc, they can cause a great deal of pain. The drying out of the disc. When we are born, the disc is about 80 percent water. As we age, the disc dries out and doesn't absorb shocks as well. Degenerative disc disease refers to a condition in which pain is caused from a damaged disc. 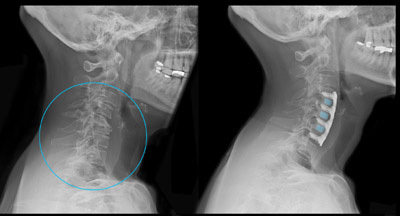 The X-ray shows degenerated discs on the left before surgery. On the right is an X-ray of the discs after traditional spinal fusion surgery. Weakness in the leg muscles or foot drop, a possible sign of damage to the nerve root. A diagnosis is based on a medical history and a physical examination, as well as the symptoms and the circumstances where the pain started. Magnetic resonance imaging can show damage to discs, but it alone cannot confirm degenerative disc disease. Degenerative disc disease isn't actually a disease, but rather a condition in which a damaged disc causes pain. This pain can range from nagging to disabling. The condition can be caused by the drying out of the disc over time, daily activities, sports and injuries. Treatment options include disc replacement, other surgical interventions, and nonsurgical options such as acupuncture, back graces and pain management.